I did the final polish of my mosaic gaze ball. Now I’m looking forward to making another project. Finished painting some necklace display stands for my upcoming jewellery events. Gave the bathroom a good bit of spit and polish – it is now nice and sparkly. Sorted through all my old receipts I have kept – just in case!! I cleaned out under the carport so my beautiful new car can fit in there properly. Then I finished of my evening by scanning and saving a heap more of my old photos. Now they are ready for scrapbooking. It is great how old photos can transport you to another time and place. This shot is of my kids, Shane and rachel back in 1985. 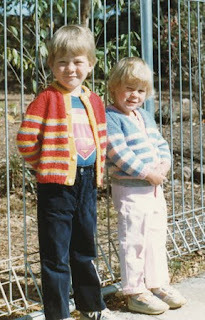 Shane was 4 and Rachel was 3, oh they are so cute. Wow, have I had a busy day or what? But how good do I feel having accomplished and completed so much? What will tomorrow bring? I think we are going to go for a drive to Daylesford, which is a country town about 2 hours away. So I will make sure I have my camera at the ready. You're on a roll and getting so much accomplished, good for you! I hope you had yet another fantastic day, take care and hugs from across the pond (as the English say!). Have a great July 4th.